Designed to meet the rugged demands of Australian conditions and delivering multiple source charging for DC systems. The Enerdrive ePOWER DC2DC+ Battery Charger is a fully automatic multistage, multi input battery charger with the ability to charge from either an alternator linked to a battery; or via solar power with the in built Maximum Power Point Tracking (MPPT) Solar Controller. ePower DC to DC battery charger is smaller than our most compact AC Battery Charger. The Enerdrive ePOWER DC2DC+ Battery Charger is a fully automatic multistage, multi input battery charger with the ability to charge from either an alternator linked to a battery; or via solar power with the in built Maximum Power Point Tracking (MPPT) Solar Controller. With two inputs available, the main/house battery will be charged from either the engine while underway, or via the solar panels when stationary. The process to choose either engine or solar is fully automatic and both functions are controlled from within the unit itself without the need for external relays. During normal operation the ePOWER DC2DC+ Battery Charger will do a full charge cycle to float stage on the house battery bank with ability to choose either GEL, AGM, Flooded, Custom Programmable or Lithium. Once float stage is reached the charger transitions to a power supply mode to support any on-board DC loads. The ePOWER DC2DC+ Battery Charger is a fully automatic, set and forget charger. It is designed to quickly and accurately recharge your deep cycle batteries utilising charger algorithms that help to maximise the life of your specialised deep cycle batteries. The ePOWER DC2DC+ Battery Charger features multistage smart charging technology that enables the charger to be connected to your battery bank permanently. With the input of multiple sources, you can be assured of charging your batteries whenever underway; or when the sun is shining on your solar array. As dictated by battery manufacturer’s recommendations, deep cycle batteries require a multistage charge sequence for perfect, fast and accurate charging. 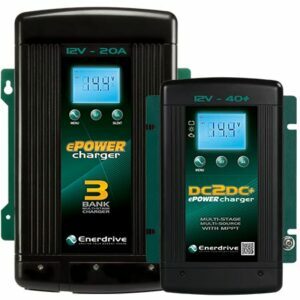 The Enerdrive ePOWER DC2DC+ smart charger delivers three primary charge stages. Stage 1 – Bulk or Boost charge; The battery is charged at full rated output current of the charger until the battery reaches its final charging voltage, known as its absorption voltage. In this step, around 80% of the battery is recovered as fast as possible. Stage 2 – Absorption Charge; With the charger voltage held steady, the remaining 20% is replaced with the charger allowing the current to taper off as the battery approaches full charge. Stage 3 – Float; Finally, in the float stage the charger voltage is lowered and held at a constant and safe predetermined level. This prevents the battery from being overcharged, yet allows the charger to supply enough current to make up for the self-discharge losses of the battery, while supporting any additional loads connected to the battery (such as DC lighting and refrigerators). This stage allows for the charger to be used as a DC power supply. The ePOWER DC2DC+ Battery Charger will regulate its output based on the loads connected to your battery bank. This function is important to maintain the life of your battery bank as some battery chargers mistake loads for discharge and continue to keep the batteries in the bulk or absorption stage for extended periods of time, which will damage the battery bank. The ePOWER DC2DC+ Battery Charger has two methods of load based regulation to ensure your battery charger transitions to float when it should do so. Included standard with all ePOWER Battery Chargers. * Maximum achievable output on the DC2DC+ unit when using 20Voc Solar Panels will be the approx 35amps. ** Maximum achievable output on the DC2DC+ unit when using 43Voc Solar Panels will be the approx 47amps. ## IMPORTANT NOTE: Estimated Amps Output is quoted based upon PERFECT Solar conditions including Sun Angle, Panel Mounting angle and Orientation to the sun. It needs to be noted that panel performance alters dramatically between Summer and Winter periods and actual performance may be impossible to predict.